aul Juhasz and I founded Willo Pond Morgans over twenty years ago. Paul and I both loved the country and all of God’s creations. We found a home in the country, secluded from the world and there working together we made many of our dreams come true. Paul had his woods to hunt and pond to fish. Now -- was my opportunity to pursue my life long dream ........ to own a horse. The opportunity arose and Paul traded his old beat up Ford truck for a chestnut Morgan -Thoroughbred filly. To me, she was the most beautiful horse in the world. Our country home did not have a barn for a horse. Of course, we had to have a barn for our new filly. Paul cleared our woods and built a small neat barn. I spent hours grooming and working with the filly and due to her temperament learned a lot about handling a horse. Of course, we could not just have one horse ...... she needed company in the pasture, etc. Now that we owned a registered Morgan, it was time to name our farm. 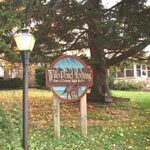 We chose Willo Pond Morgans due to the peaceful willow trees that graced the lovely pond in front of our home. Next, we wanted a foal from Marja. Our first breeding experience was an exciting adventure. We had to find the perfect Morgan stallion for Marja. We looked at many and chose a gorgeous stallion, Edgewood Ethan Aaron (Moro Hill’s Rob Roy x Joyride’ Jeepette). This cross produced our first Morgan foal, Willo Pond Windwalker - WILLY. A long legged dark bay colt that matured to 15.2 hands. He will never leave Willo Pond Morgans ....... He was our first foal, and it would not be the same without this wonderful gelding. This was just the beginning of our love for Morgans. After researching registrations, reading books, articles, farm visits and talking to numerous horse owners, we knew we had found our breed -- the Lippitt Morgan. We never seemed to tire of reading and watching videos, etc. about the Lippitt Morgan. We enjoyed studying horse conformation and watching how a horse moves -- how each bone, muscle, and every part of the horse had to work together. In the year of 1985, due to another Lippitt breeder, we were given the opportunity to purchase three Lippitt Morgans from a farm in the East. They consisted of two Lippitt Morgan mares and a Lippitt Morgan stallion. We wanted the stallion! We had studied Lippitt lines and this stallion seemed to be just what we were looking for. All the arrangements seemed to take forever. We were delighted and proud when Covenant Knight Heir (Meredith Knight x Covenant Karah Moro) strutted off that horse trailer. When reading the ideal description of the Morgan horse it does describes CKH: “He has a short back, good loin, short jointed, extremely short cannon bone and fetlocks, wonderfully oblique shoulder, small ears. He has an extremely broad forehead, full eyes that set out prominently. Other qualities are the breadth of his chest, the excellent muscle and bone, his full quarters, long underline, and overall breadth and depth. He never stands a moment when shown to bridle. Yet with all the exuberance of spirit, he is as gentle as a lamb.” We had never planned to own a show horse -- but due to CKH’s presence, versatility and talents everyone who visited or saw him exclaimed “You have to show him.” He was young and we knew little about showing a horse, therefore, it was time to find a trainer for him. Together, they worked hard to gain perfection for the show ring. His first show, was the first of many future blue ribbons. 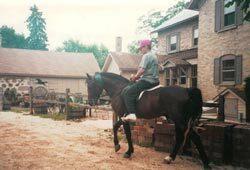 Everywhere we went, people would come to his stall and exclaim, “That’s what a Morgan should look like.” CKH had started his show career at small open shows, then Class A shows, and on to winning top ribbons at the Grand National and World Morgan Horse Show. It was always a special honor when he often won the coveted Justin Morgan Class. CKH and his trainer were invited to perform at many special demonstrations. Due to his presence and versatile talents, they performed to a wide variety of audiences around the country. 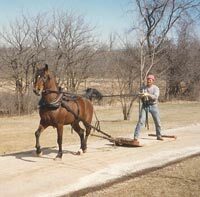 CKH has proven the versatility of the Morgan horse. Due to training and conditioning, in one show they competed in saddle seat, hunt, western, in hand, driving, trotting race, pulling the log, etc. They won high point stallion, the Justin Morgan Working Award and High Point Show horse. In the year of 1992, CKH won the prestigious Lippitt of the Year Award. We traveled to the Lippitt Country Show in Vermont to accept the award. Our daughter, Cathy Juhasz, wrote and sang a song that was taped and played during the presentation. (Added note: Our talented friends, Reed and Ann Allen, produced an outstanding farm video. Cathy’s song became the theme music for the video, Willo Pond Morgans Tribute to the Lippitt Morgan Horse.) The request for breeding mares began. Again, we researched and added full Lippitt mares to our farm, thus began our Willo Pond breeding program. Following are two of our first mares bred to CKH, that gave us the quality foals we were breeding to achieve.